Fill out our simple form and get quotes from local Sushi Caterers. Sushi catering is an increasingly popular form of catering, and whether it’s impressing at a corporate event or filling hungry stomachs at a wedding, having your own sushi chef at an event is a great look! It’s not just the food itself, with sushi catering you also get the pleasure of watching a chef, highly trained in Japanese catering, preparing it right there in front of you. Most sushi catering suppliers will let you choose whether you want your chef to prepare food behind the scenes or out in front. If you’re looking for high quality, handmade Japanese catering, you’re in the right place. To hear from the best sushi catering in your area, simply complete a request form. Authentic Japanese Katsu Chicken, Tempura prawns and Sushi delivered to the public on an exotic Airstream trailer. Sushi catering can take a number of forms, but the most popular are usually canapes comprised of sushi rolls (sushi rolled in a nori sheet with a filling) and nigiri (delicate rice balls with a topping). Most sushi catering suppliers will also offer waiting staff who are trained in serving sushi and other types of Japanese catering. 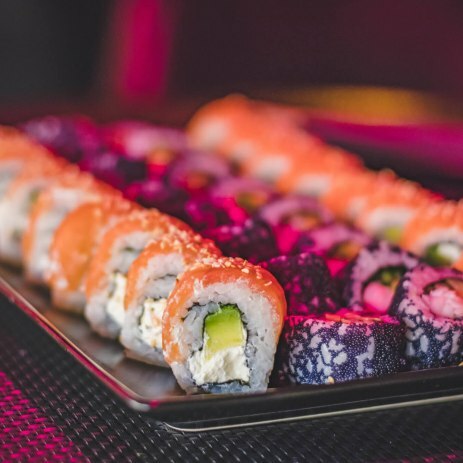 It doesn’t need to be all fish either, if you’ve got vegetarians and vegans at your event then just ask your supplier if your sushi catering can also contain some vege-friendly sushi rolls. To find out more about sushi catering and to hear from local suppliers, all you need to do is complete a request form.